Last year, Pete Johnson of Tatuaje re-introduced three cigars he had discontinued in 2007: Nuevitas, Nuevitas Jibaro No. 1, and Nuevitas Jibaro No 2. If you don’t recall them by name, perhaps you will remember them as the Tatuaje cigars not made by Don José “Pepin” Garcia. Tatuaje is synonymous with Garcia and My Father Cigars. Today even more so, because the three cigars that used to be crafted at Tabacalera Tropical in Nicaragua are now handmade at the My Father Cigars S.A. factory in Estelí. The trio features a Nicaraguan Corojo ’99 wrapper around Nicaraguan tobaccos. If not for the differences in the bands, you could be forgiven for confusing Nuevitas with Jibaro No 1.; but Johnson threw us a bone and made the former white with orange trim, and the latter orange with white trim. Jibaro No. 1 also has an exposed foot. But while Nuevitas (5 x 52) and Jibaro No. 1 (5 x 54) are virtually the same size, Jibaro No. 2 is a toro-sized smoke (6 x 52). It sells for just under $10 for a single and also has an orange band and an unfinished foot. Jibaro No. 2 is a moderately oily specimen with its fair share of thin veins and noticeable seams. The cold draw is smooth. The wrapper has a faint citrus aroma with some dry earth, but the foot is awash with hay and a sweet nuttiness. 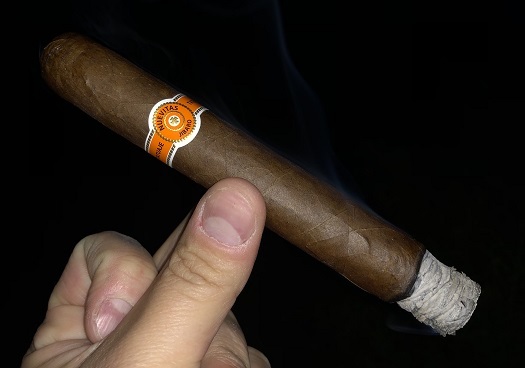 After setting flame to the binder and filler, the cigar yields a spice-forward introductory profile with white pepper, black pepper, and cedar at the core. On the palate, the spice hits the tip of the tongue the hardest. Background notes of bread and warm tobacco add some depth, but the overall sensation is very dry and spicy. If you allow the Jibaro No. 2 to rest between puffs, the smoke will cool and the spice will subside. What’s left, however, is a dry, papery taste that’s in need of… well, flavor. That flavor starts to build around the midway point with soft floral notes, citrus, and cinnamon. A smooth creaminess contributes complexity which, up to this point, had been frankly lacking. The spice recedes, and the texture is bready. These changes are too little too late, though. They’re also short-lived. The final third is hot, harsh, spicy, and papery. While the physical properties are in line with what we’ve come to expect from My Father Cigars—including a solid ash, clear draw, straight burn, and good smoke production—the flavors simply aren’t up to par. There are many, many wonderful Tatuaje cigars. Too many to cite here. But I’m sorry to report the Nuevitas Jibaro No. 2 leaves much to be desired. In my book, it earns a disappointing rating of two and a half stogies out of five.